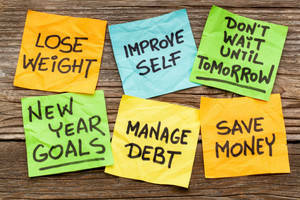 It’s that time of the year – time to accomplish all of your goals in your New Year’s resolutions. You may want to become more motivated, more disciplined, save or make more money, do better at your job, stop smoking, get over a bad habit or addiction, eat healthier, exercise more, lose weight, get in shape. Most of the New Year’s resolutions deal with self-improvement. And hypnosis is the ideal way to improve yourself, to break bad habits, and to gain control of your mind and your behavior. Why Do So Many New Year’s Resolutions Fail? 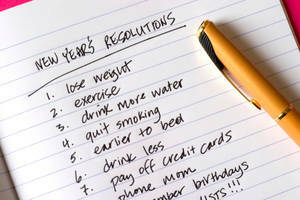 Most people choose to use their willpower to try to accomplish their New Year’s resolutions. They just grit their teeth and struggle to overcome the challenge. If you only use willpower, you are setting yourself up to fail. Willpower is trying to consciously do what your subconscious mind does not want you to do. When you are using willpower, you are actually fighting against yourself. Your active or thinking mind is doing the opposite of what your higher mind, or your subconscious mind, has been doing for a long time. Instead of fighting against yourself, hypnosis will allow your mind to become more balanced. Your entire being will want to achieve the same goals. Every part of your mind will desire the same thing. Hypnosis is the easiest and most efficient way to overcome any obstacle or adversity. You can use hypnosis to help attract success into your life. Desire – How Bad Do You Want It? The most important factor in accomplishing the goals in your New Year’s resolutions is your desire. How bad do you want it? Are you willing to do anything and everything you can? Are you willing to make sacrifices? Can you overcome the tug of other people’s opinions? If you really want it bad enough, you will be successful. But success does have a price. Nothing worthwhile is easy. And nothing is as satisfying as a silent conquest of ourselves.